James and Livia Reasoner, a husband and wife team, wrote a ghostly, riveting young adult novel. They take the reader down an exciting trail of imagination and mystery. Codi Jackson has lived in a lots of new places because her father frequently changed jobs. She now has a chance to become a part of a group, if there is not another job change in her father’s future. Codi’s history teacher assigns Keith Wright as her partner for a history project about the Texas Rangers. To help with the project, her grandmother sends her a box of artifacts that belonged to her great-great grandfather who had been a real Texas Ranger. What she learns about her ancestors makes the project more and more interesting. She discovers that she was named after her legendary Texas Ranger ancestor, Cody Jackson. Imagine her surprise when she picks up the Ranger’s badge and feels the heat it generated. Even more surprising is the appearance of her great-great grandfather’s ghost. After the initial shock wears off, Codi cautiously accepts the presence of the Phantom Ranger. 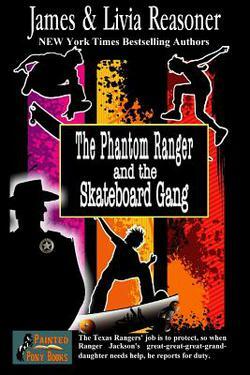 Later they work together to try to solve a crime spree perpetrated by teens on skateboards at the local mall. Read the book to see if they succeed. Teens will love the independence of the kids in the story and the underlying mystery mixed with some ghostly humor. I think anyone would enjoy this quick, exciting read. Be sure to get it and find out what happens to Codi, Keith and a spectral Texas Ranger.